When something works, keep doing it. That’s what the Michigan coaching staff decided to do when it extended an offer to another uber-athletic basketball recruit out of Kansas with limited organized football experience and an offer from Missouri State. 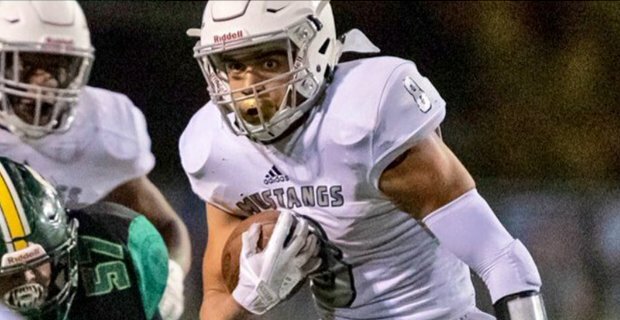 And just like in the 2018 class, they landed that target as 2019 Blue Valley North (KS) ATH Amauri Pesek-Hickson has committed to Michigan during his first visit to campus. Pesek-Hickson is an athlete. He’s fast, physical and can leap tall buildings. Maybe not tall buildings but dude can jump out of the gym. But he won’t be coming to Michigan to play under John Beilein, he’s coming to Jim Harbaugh to play in the Big House. Where exactly will he play in the maize and blue? That’s not exactly known as he has the size and skill to play safety, linebacker or on offense as an h-back as he can make plays in both the running and passing game. I like him more on offense, especially in a Swiss Army Knife-like role as he continues to put on size. This was a pretty quick recruitment (similar to fellow Kansas high school basketball standout turned UM football commit, WR Ronnie Bell) as Michigan offered on October 30th and the Wolverines immediately became the leader after Pesek-Hamilton called UM his “dream school”. It also helped that Michigan was only the second offer for him along with Missouri State. It didn’t take him long to make a visit to campus as he made the trip from Leawood to Ann Arbor for the home finale against Indiana. Crystal Balls started flowing in for Michigan as his visit was announced and they were proven right as he committed to the Wolverines prior to even taking in the game against the Hoosiers. He becomes the 24th commitment of a class that looks like it could be pretty special. Pesek-Hickson is the 25th overall commitment in 2019 and the first out of Kansas. This class is loaded already but the best may be yet to come as Michigan is sitting pretty with five-star DE Zach Harrison and four-star OT Trevor Keegan, is in a battle with Clemson for five-star ATH Quavaris Crouch, and may end up landing five-star DE George Karlaftis if Jeff Brohm bolts on the Boilermakers for his alma mater. Other names to watch out for in this class is newly offered OT Dawand Jones and CB Jalen Perry, who also visited Michigan for the Indiana game.